Privatheit ist eine wichtige Grundlage für ein selbstbestimmtes Leben. In einer immer stärker vernetzten digitalen Welt ist sie von vielen Seiten bedroht. 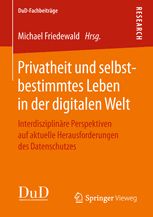 Die Beiträge des Buches untersuchen aktuelle Herausforderungen für Privatheit und Datenschutz aus multidisziplinärer Perspektive. Thematisiert wird dabei u.a., welche Rolle Privatheit in der Gesellschaft einnimmt, wie Bürger diese heute verstehen und wie sie mit den zunehmenden Angriffen darauf umgehen. Darüber hinaus befassen sich die Beiträge mit der europäischen Datenschutzpolitik und neuen Regelungsformen für einen wirksameren Datenschutz. 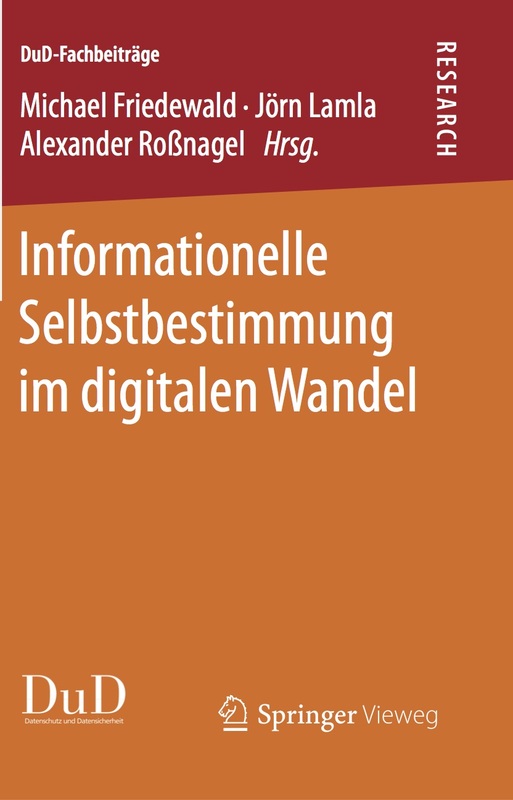 Soeben ist im Springer Vieweg-Verlag das Buch “Informationelle Selbstbestimmung im digitalen Wandel” erschienen. Der Band umfasst 17 ausgewählte Beiträge zur Konferenz, die das “Forum Privatheit und selbstbestimmtes Leben in der digitalen Welt” im November 2015 in Berlin ausgerichtet hat. Die Autoren des Buches untersuchen die historische und sachliche Bedingtheit des Konzepts der informationellen Selbstbestimmung, das zum Zweck des Persönlichkeitsschutzes in der modernen Datenverarbeitung zu einer Zeit und für Umstände entwickelt wurde, die inzwischen längst überholt sind. Thematisiert werden seine auch in absehbarer Zukunft erhaltenswerten Kernaussagen sowie die Änderungen, die in seinem Verständnis und seinen Umsetzungen notwendig sind, um die Ziele der informationellen Selbstbestimmung in einer veränderten digitalen Welt zu erreichen. This volume examines the relationship between privacy, surveillance and security, and the alleged privacy-security trade-off, focusing on the citizen’s perspective. It is based on talks given at the joint conference of the PRISMS, SurPRISE and PACT FP7 projects held in Vienna in November 2015. Recent revelations of mass surveillance programmes clearly demonstrate the ever-increasing capabilities of surveillance technologies. The lack of serious reactions to these activities shows that the political will to implement them appears to be an unbroken trend. The resulting move into a surveillance society is, however, contested for many reasons. Are the resulting infringements of privacy and other human rights compatible with democratic societies? Is security necessarily depending on surveillance? Are there alternative ways to frame security? Is it possible to gain in security by giving up civil liberties, or is it even necessary to do so, and do citizens adopt this trade-off? 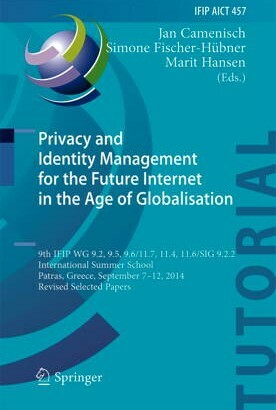 This volume contributes to a better and deeper understanding of the relation between privacy, surveillance and security, comprising in-depth investigations and studies of the common narrative that more security can only come at the expense of sacrifice of privacy. 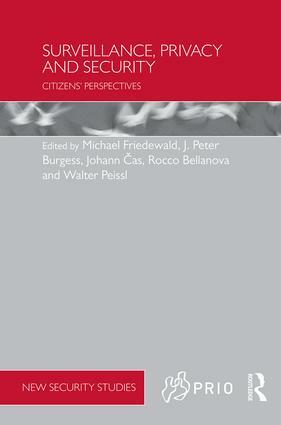 The book combines theoretical research with a wide range of empirical studies focusing on the citizen’s perspective. It presents empirical research exploring factors and criteria relevant for the assessment of surveillance technologies. The book also deals with the governance of surveillance technologies. New approaches and instruments for the regulation of security technologies and measures are presented, and recommendations for security policies in line with ethics and fundamental rights are discussed. Apart from the hardcover edition, there is also an e-book that is available via green way open access. This volume examines the relationship between privacy, surveillance and security, and the alleged privacy-security trade-off, combining theoretical research with empirical research focusing on the citizen’s perspective. Recent revelations of mass surveillance programmes clearly demonstrate the ever-increasing capabilities of surveillance technologies. The resulting move into a surveillance society is, however, contested for many reasons. Is it possible to gain in security by giving up civil liberties, or is it even necessary to do so? Do citizens adopt this trade-off and, if yes, are they willing to enter into this trade? The book presents quantitative and qualitative data gained from empirical research encompasses representative European-wide opinion surveys, the involvement of citizens in large-scale participatory technology assessment studies as well as studies on specific surveillance technologies. The contributions provide insights into the factors and criteria relevant for the assessment of surveillance technologies, with a specific focus on the attitudes and the reasoning of citizens vis-à-vis the legitimacy and necessity of these technologies. A second core theme is the governance of surveillance technologies. New approaches and instruments for the regulation of security technologies and measures are presented, and recommendations for security policies in line with ethics and fundamental rights are discussed. The book presents the results of a number of large scale surveys in which citizens’ perceptions on privacy and security are investigated. A second feature of this book is that, contrary to most existing books, it makes citizens the main focus of investigation. What is their position in the discourse around surveillance and security? How are they involved in the development of surveillance/security practices? How do they feel about current surveillance technologies and practices and how is their behaviour determined? This book will be of much interest to students of surveillance studies, critical security studies, intelligence studies, EU politics and IR in general. Popular everyday appliances – like televisions – are increasingly connected to the internet and engage in the collection of personal data. The resulting data on user behavior, the transmission and processing of this data and the increasing complexity of smart technologies pose new challenges to privacy protection and informational self-determination. In the White Paper “Hidden Internet“, experts from the research network “Forum Privacy and self-determined life in the digital world“ outline the problematic aspects of smart technologies for privacy and how these issues might be addressed. The White Paper focuses on three applications – smart TVs, smart cars and wearable devices like smart watches. Smart TVs or smart bracelets that are connected to other devices, services and manufacturers via the Internet of Things increasingly belong to the everyday life of society. Users welcome the internet-based services and functions of these smart appliances – but are often not aware of the extent to which their data are being collected, and processed. These problems are enhanced by the increasing complexity of smart technologies; it is almost impossible for users to follow whether and how personal data can be protected against unauthorized access or disclosure. In the light of these changing framework conditions for privacy and data protection, the research network “Forum Privacy“ describes the risks that may result from using smart TVs, smart cars and wearables in its White Paper “The hidden Internet“. For instance, smart TVs already gather use and behavioral data when people are just watching television and even enable personal identification by photo, audio and video recording. This means that large segments of the population can be monitored. All this applies in a similar way to smart cars that record vehicle-related, driver behavior and environmental data and can transmit these to vehicle manufacturers or other transport users. Alongside information about driving style, location or route, the personal characteristics and habits of the drivers can be derived by linking this information with other data. This is also the case for so-called wearables – devices like smart fitness bracelets or smart watches that are worn in contact with the skin. The health data wearables gather allows detailed insights into the private lives of users. Peter Zoche, who coordinates the research activities of the Forum Privacy Project at Fraunhofer ISI, cites some of the main problems and design potentials for manufacturers, users and policymakers: “The demand for informational self-determination is faced with non-transparent data trading and concealed data collection. On top of this, it is often hard to change the default settings of smart devices. And if users want to take action themselves to ensure greater data protection, they are confronted by a flood of information and complex terms and conditions“. According to Zoche, networked devices and applications should have privacy-enhancing settings (privacy by default), take users’ information requirements into account and have visual or acoustic signals that alert users to possible data transfers. Furthermore, in future, political and legal regulations should ensure that smart technologies are more in line with the principles of data protection. Appropriate conditions for guaranteeing privacy in the digital age could be created using sanctions, as well as by enforcing EU data protection legislation. Alongside state institutions and initiatives, however, industry must also contribute by making data protection a core design element when introducing new smart devices and applications (privacy by design). Last, but not least, users themselves will need to handle their personal data and the associated risks with greater awareness. In the Forum Privacy Project, which is funded by the German Federal Ministry of Education and Research (BMBF), national and international experts from different disciplines address the issues surrounding privacy protection over a period of three years. The project is coordinated by Fraunhofer ISI, and the partners are Fraunhofer SIT, the University of Hohenheim, the University of Kassel, the Eberhard Karls University of Tübingen, the Unabhängige Landeszentrum für Datenschutz Schleswig-Holstein and the Ludwig-Maximilian University of Munich. The research results of the Forum Privacy Project are intended not only as input to scientific debate, but also to be of use in educating normal citizens regarding privacy protection. This paper considers the relationship between privacy and security and, in particular, the traditional ”trade-off” paradigm that argues that citizens might be willing to sacrifice some privacy for more security. Academics have long argued against the trade-off paradigm, but these arguments have often fallen on deaf ears. Based on data gathered in a pan-European survey we show that both privacy and security are important to European citizens and that there is no significant correlation between people’s valuation of privacy and security. Wenn heute vom Computer gesprochen wird, ist meist der kleine “Kasten” mit Tastatur, Bildschirm und Maus gemeint, der seit 1981 den Weg in Millionen Büros und Haushalte gefunden hat und meist zur Textverarbeitung, für Kalkulationen, zum Spielen und zunehmend auch als Medium für Kommunikation und Information verwendet wird. Davor war ein ganz anderes Bild des Computers in der Öffentlichkeit vorherrschend. Computer waren riesige Geräte, mit deren Betrieb ein ganzes Team von Technikern, Operateuren und Programmierern beschäftigt war. Erst mit der Entwicklung preiswerter Speicherbausteine und Prozessoren sowie dem Auftauchen junger, risikobereiter Unternehmen wie Xerox, Apple oder Microsoft, die an den Erfolg von preiswerten Computern für jedermann glaubten, wurde der PC Anfang der achtziger Jahre zu einem gefragten Produkt. Dabei zeigte sich, daß der Erfolg nicht nur in den technischen Eigenschaften begründet liegt, sondern auch in der veränderten Einstellung breiter Bevölkerungsschichten. In diesem Buch wird vor allem der Frage nachgegangen, vor welchem kulturellen Hintergrund die Idee der persönlichen Informationsverarbeitungsmaschine entstanden ist und wie sich diese im Laufe der Zeit unter dem Einfluß anderer Wissenschafts- und Technikentwicklungen verändert hat. Geschildert wird die spannende, aber wenig bekannte Entwicklungsgeschichte des interaktiven Computers von 1945 bis 1985, aus der deutlich wird, daß der Computer in seiner heutigen Form der Schlußpunkt einer eher zufälligen Folge lokaler Gegebenheit und Umstände ist, die sich die zahlreichen Akteure so gut es eben ging zunutze machten. Die Arbeit wurde im Jahre 1999 vom Verein Deutscher Ingenieure mit dem Rudolf-Kellermann-Preis für Technikgeschichte ausgezeichnet.